Not too many people know that Niccolò Machiavelli and Leonardo Da Vinci, the famed Florentines, collaborated on a singular civil/military engineering enterprise to deprive the city of Pisa of water, with the hope of subduing it. By the Spring of 1504, Pisa had been independent of Florentine rule for nearly a decade. At that time, Leonardo convinced the rulers of Florence, located upstream of Pisa, to construct a canal to divert the waters of the River Arno, thus depriving Pisans from the water that they had become accustomed to. 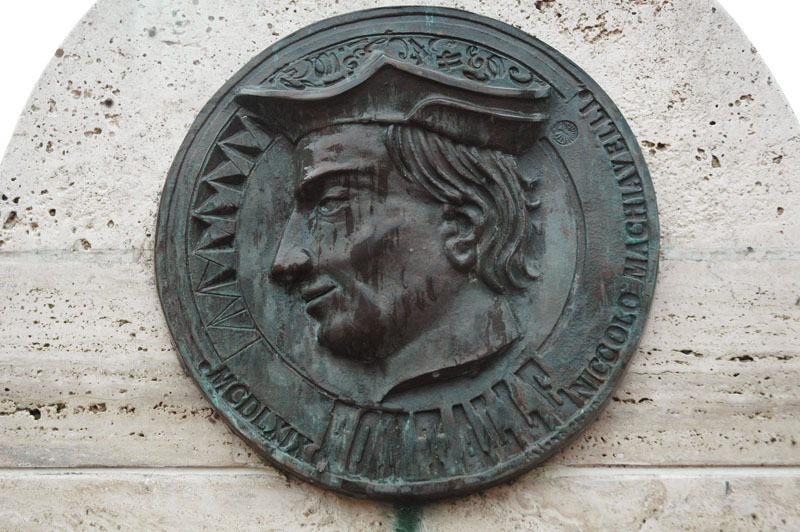 While the canal was technically Leonardo's brainchild, the actual task of construction, which started on August 20, 1504, was entrusted to a relatively obscure engineer named Colombino. The builder made some changes to Leonardo's design, primarily to appease Machiavelli's urging for haste. When things did not work according to plans, Machiavelli began to doubt the canal design. To make matters worse, by the first week of October, a violent storm struck, which caused the walls of the canal to collapse. Thereafter, the project was speedily abandoned and the Pisans came out to fill the ditch. Thus ended Machiavelli and Leonardo's brief and ill-fated incursion into hydraulic engineering. 1 King, R. 2007. Machiavelli, Philosoper of Power. Harper-Collins. Plaque of Niccolò Machiavelli, at Sant Andrea in Percussina, Tuscany, Italy.